About eight years ago, I used to go to a famous hairstylist in Hong Kong. He was expensive but now that he is really really famous, he is ridiculously expensive so I no longer go to him. The last time I saw him, he was talking about the difference in the way Asian women and Caucasian women age. He said that Asian women’s face get fatter whereas Caucasian women’s face get thinner. The Caucasian women lose a lot of fat in their face, so by their 60s, they look old, tired and haggard. On the other hand, Asian women for some reason get fatter, rounder faces. He said as the face gets wider, we look old, unattractive (more matronly) and more masculine. But youthful faces are small and ideally oval or tear shaped with the right amount of fat. Back then, I just nodded my head listening to him gab on and on, but honestly I thought that what he was saying was silly and complete hogwash. I wanted him to pay more attention to cutting my hair rather than wasting time by explaining his “philosophy” on faces. Anyway, eight years later and I have to give him some credit. I have noticed that some Western women do lose a lot of fat in their faces and they look old as a result. As for Asian women, yes, I’ve noticed that some of us bloat more in our faces. I admit that for some reason my cheeks have gotten wider so now I have more of a heart shaped face. And I’m noticing that my mom’s face looks bigger too — she gained weight so it seems to have gone to her cheeks and neck. Oh no! So what do we do? Well, lucky for us, the recent makeup craze is contouring. I tried various “contouring” kits and went on YouTube to find tutorials. But honestly, they put on way too much makeup. Kim Kardashian has photos of her before and after contouring and I prefer her before photo! I tried following the direction from one makeup artist on YouTube and everyone who saw me with my new “contoured face” asked if I felt okay because I looked sick! But I finally figured it out. The best is to use a contour stick. I’ve tried powders, creams, etc — from Tom Ford, MAC, Anastasia to Tarte. 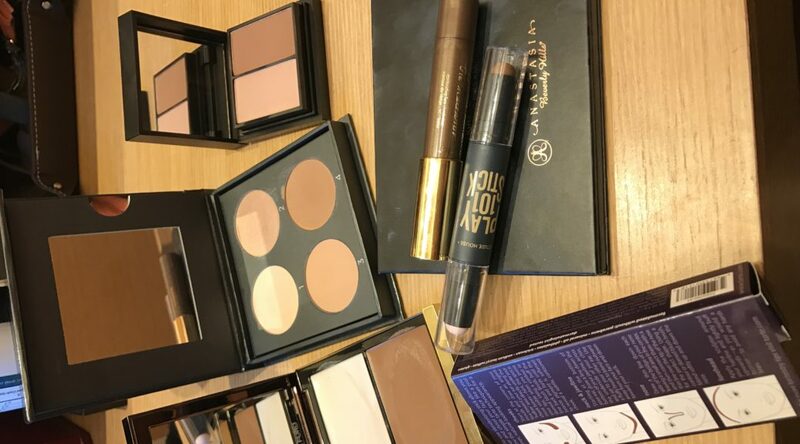 But the stick is the easiest (Anastasia contour kit has so many colors and I have no idea what they are for — for example, why do we need a banana color?). I love using the stick; it is super convenient and all you need to do is just draw a couple of short lines from each ear towards the nose, under your cheekbones, and then use your Blender to blend it in. I don’t use the contour in any other place — I just focus on the sides of my face to help make it look a bit slimmer. My favorite stick is Etude House Play 101 Stick Contour Duo (one side highlighter and other side contour). I use color #1 because the highlighter has a nice shimmer to it, which I really like. Ladies, if you want a slimmer face, give it a go. Etude is a Korean brand and is reasonably priced. Just don’t forget to blend, otherwise you look like you have side burns! Women – Where is the Support?